You are on Broadway's Center Stage during this highly anticipated annual event! Witness the annual passing of the gavel as we thank the 2018 Board of Directors for their service and welcome our 2019 leadership. You won't want to miss the announcement of our annual business and volunteer winners! What a great way to start the year! 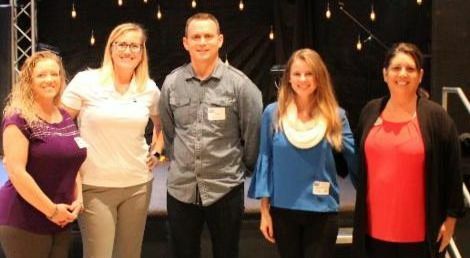 The first Chamber Breakfast of 2019, hosted and sponsored by Crosspoint was a huge success. 200 Chamber members and guests joined us for networking and fellowship in the Community Life Center. Chamber Board Member Rev. Rural Ausley entertained the crowd while talking about the programs, services and growth of Crosspoint. He also presented a $1,000 donation to the Chamber! Thank you, Crosspoint! Our new 2019 Chamber Chairman, Mike Guidry, Reliance, Test & Technology had the crowd energized for another great year. #creditthechamber #keepitlocal. Click here for more Breakfast photos. 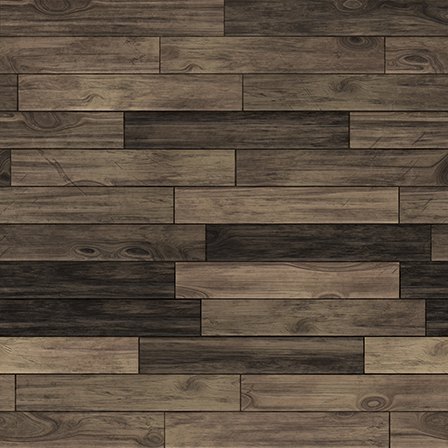 Please feel free to tag yourself and/or your business. January Chairman's You Rock Award, sponsored by Bay Area Awards and Engraving, Inc presented by 2019 Chairman of the Board Mike Guidry, Reliance, Test & Technology, Inc.
Our new 2019 Chamber Chairman, Mike Guidry, Reliance Test & Technology, LLC has been busy visiting Chamber members and he wants you to have a chance to win a $25 gift card to Cafe Bienville! 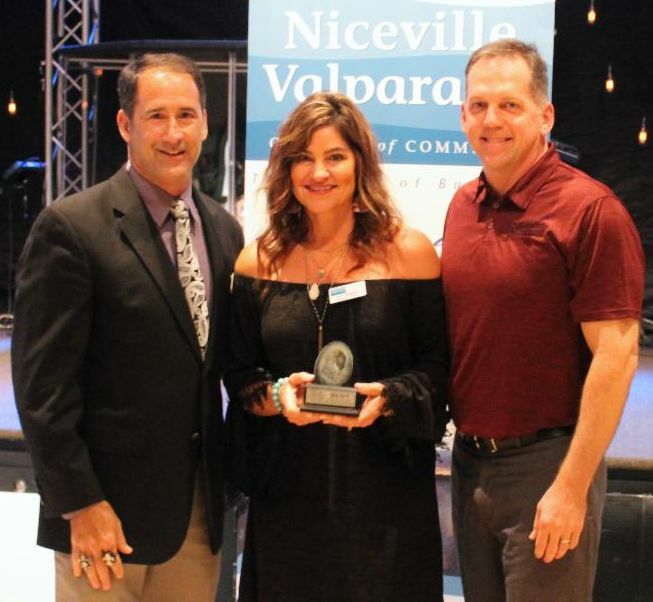 To be included in the drawing at the February Breakfast, simply like the Niceville Valparaiso Chamber of Commerce Facebook Page and comment the names of the three businesses below. New Members at the January Breakfast. 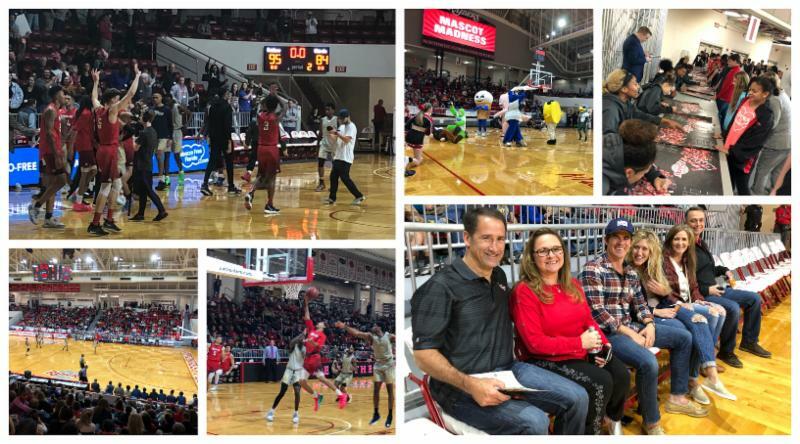 Thank you Northwest Florida State College Raiders for a great Chamber Night! Ramsey Ross, NWFSC Athletic Director gave out over 200 complimentary admission tickets to the Saturday night conference game at the Chamber Breakfast. Head Men's and Women's Coach, Steve DeMeo and Bart Walker updated Breakfast attendees on the great seasons both teams are having. Both teams pulled off a win with the support of the community & the Chamber cheering them on. Go Raiders! 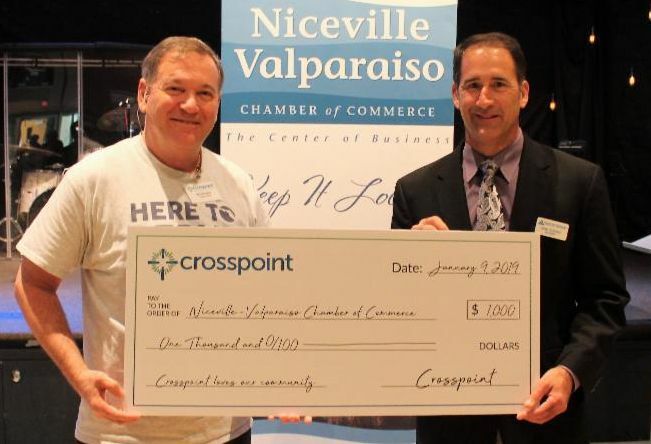 A very special thank you to Crosspoint for their generous donation to the Chamber. Chamber Board Member Rev. Rural Ausley pictured above with Chairman, Mike Guidry, Reliance, Test & Technology. 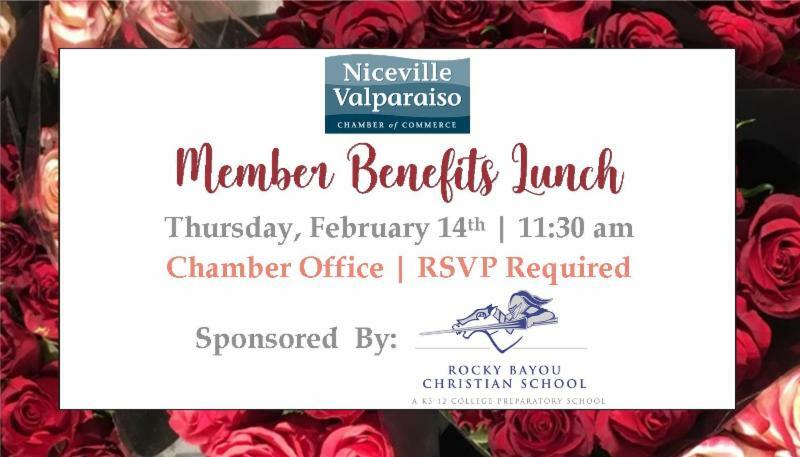 New members and representatives are encouraged to attend the quarterly Member Benefits Lunch sponsored by Rocky Bayou Christian School coming up on February 14th. 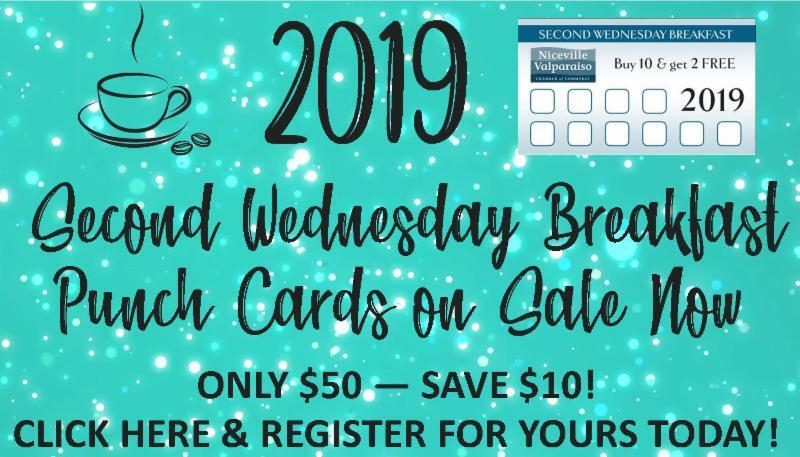 Join us for a complimentary lunch and a complete overview of all the programs, services and opportunities available to you through your Chamber membership! 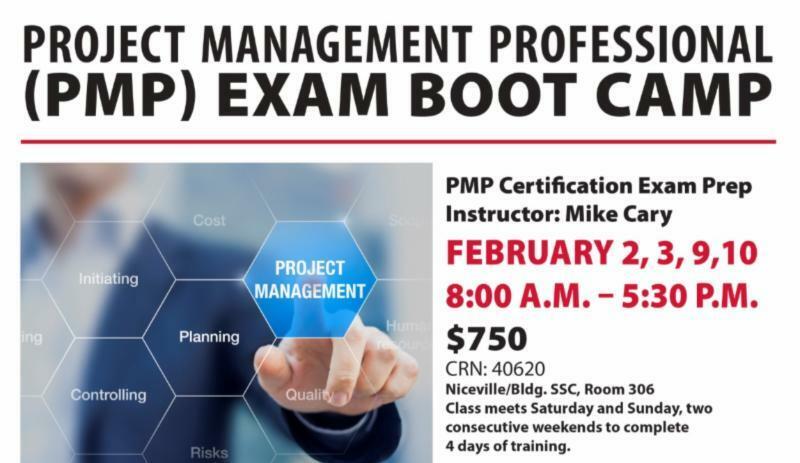 Advance registration is required.